Our DL Size Large Letter Boxes come in two different styles. 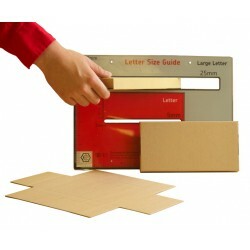 This section is for our Quick Pack DL Size Royal Mail Large Letter Postal Boxes. The Quick Pack DL PiP Boxes are manufactured without the locking tabs that slot in to one another to hold the PiP box in position which makes them easier and quicker to assemble than the Die Cut style, but does mean they are not quite as strong, therefore they are best used for items that aren't particularly fragile, but do need an outer layer to help protect from scuffs and knocks whilst in transit.